The 2016 TSMO Plan, first adopted by the RTC Board in June 2011, is now available. The updated TSMO plan presents a 5-year vision and integrated approach to implement system operations projects as a part of a multi-faceted program to meeting the region’s transportation needs. TSMO strategies focus on lower cost operational and multimodal approaches that are coordinated between technologies and agencies to make better use of existing transportation facilities. The toolkit of strategies shown on the sidebar are directed toward improving system efficiency and performance without adding new roadway capacity. They support regional transportation goals by improving travel time reliability, reducing crashes, improving transit on-time performance, and by reducing travel delay, fuel use, and air pollution. TSMO strategies can include a wide range of projects such as: traveler information, freeway management, arterial management, coordinated incident management, and transit signal priority. 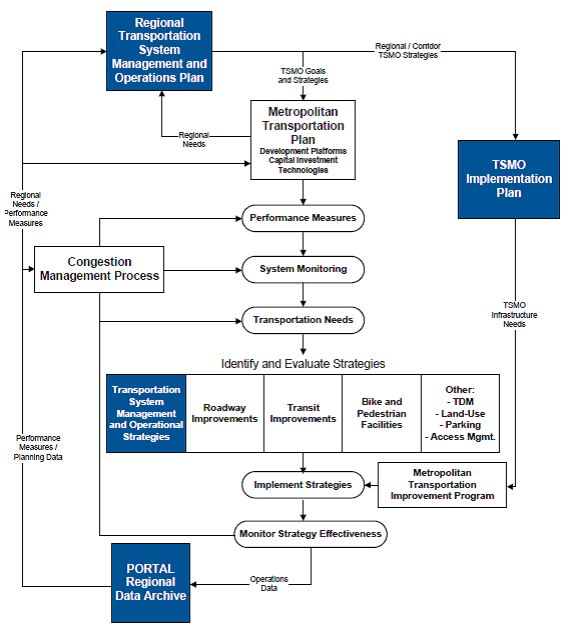 The 2016 TSMO Plan has three main sections: 1) emerging operational issues and trends that will impact the future direction of transportation systems management and operations; 2) a description of operational improvements transportation system over the last five years and envisioned for the next five and; 3) an implementation plan, which documents the ITS communications and equipment needed to build the improvements and support system management and operations.